Working from an original photo and the shell of a building, Chris & her husband redesigned the building to current codes and restored it to its former glory. Notice the magnificient wood moldings and columns, stairs and bar. The hotel opened for business in September, 2012. Chris and her husband purchased this badly damaged building and took on its restoration as a labor of love. Chris has a background in historic preservation and her husband is an engineer with a major national company, so they both had an idea of the challenges ahead. There were only a few surviving photos of the original building and less information about the interior. See the photos below and on the facebook page to get a feel of the complexity of this project. Front door transom for Kleeman House Hotel. This transom contains 158 pieces of glass, measures about 17" x 60" and was completed in September, 2011. Interior Transom for Kleemann House Hotel. This transom contains 92 pieces of glass, measures about 16" x 45" and was completed in December, 2011. I was excited when Chris asked me to play a small role in this project. She wanted a glass transom built for the front entrance to the hotel. 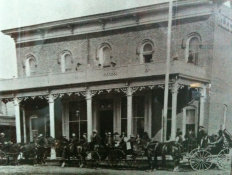 When the hotel was built in 1883, there was a stained glass transom over the door, but no one has been able to locate any pictures of it. Our challange was to create a Victorian period design that would be consistent with the design and colors of the period. I used a number of classic Victorian design elements; a shield center motif with numbers, curling vines, fleur-de-lis corner accents, earthtone colors, and lots of jewels. After the front transom was designed, Chris decided she wanted another window to go over the doorway between two rooms inside. Using a number of the same concepts and the same colors, I designed a similar but different transom for inside. I hope that my transoms fit the decor as if they were original. 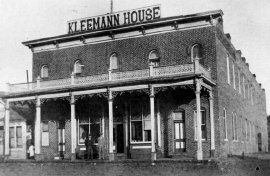 One of the most fascinating and challenging projects I have done was a pair of transoms for the Kleemann House Hotel in Custer, South Dakota. 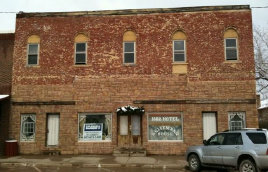 Chris and her husband Cliff purchased this 1883 building on the main street in Custer with the goal of restoring it to its former glory. 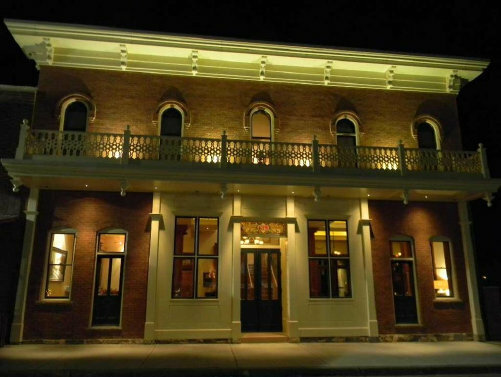 This once magnificent grand Victorian hotel has had a rich and colorful history, including stays by Buffalo Bill Cody and a number of other notables. The building had been condemned for a decade and neglected for much longer... just waiting for the wrecking ball. The pictures below show only a small part of this massive project. The building had to be completely gutted, a "newer" addition on the back completely removed, and the interior completely rebuilt! Much more of a rebuilding than a restoration. 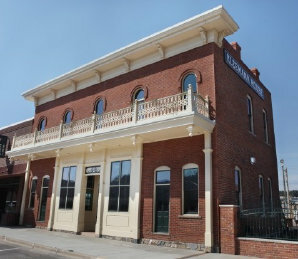 The restoration of the Kleeman House Hotel in Custer, South Dakota was finished in the fall of 2012.